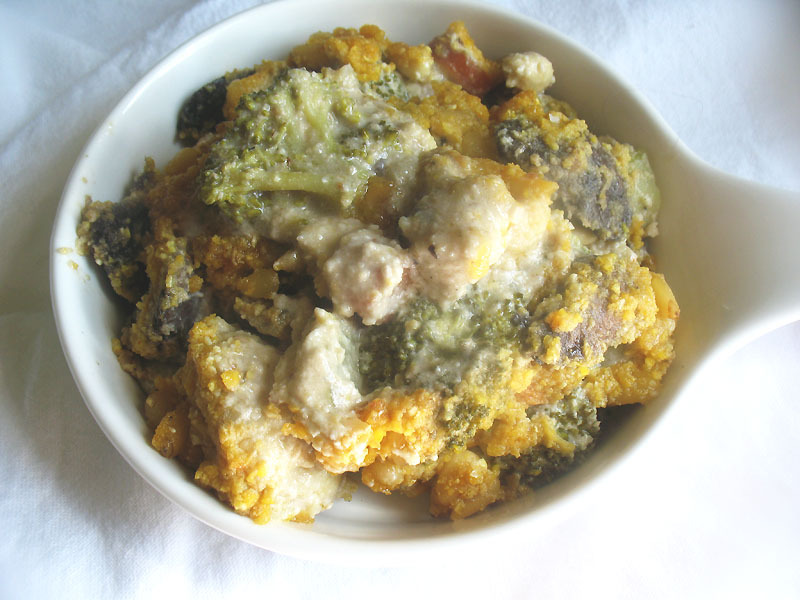 I haven't made broccoli Mornay for ages, but it's a classic baked cheese and vegetable casserole. Oddly enough, though, I dreamed about this dish the other night, giving me an instant craving. But this time around, I wasn't content to make the classic Cheddar version … too much cheese has proved not to be too good for my tummy these days. But I've had terrific success lately "veganizing" old cheese-and-vegetable standards with the help of sauces made with cashews and nutritional yeast. These are a marvelous substitute for cheese, and far better in every way than rubbery vegan cheese-like products made from soy! I was especially delighted with the result, and so were my dinner companions who thought it might have been even better than the original Cheddar version. This creamy casserole topped with a golden crunchy cornmeal and chopped nut topping ended up tasting cheesy without any actual cheese. 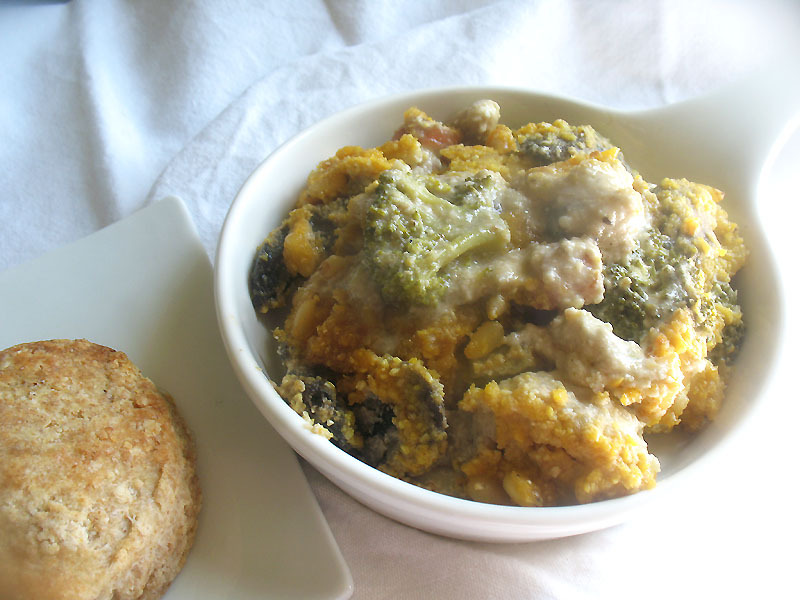 It's an ideal side vegetable dish, especially when served with plump goat cheese biscuits. 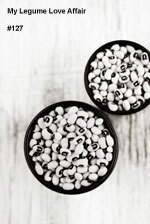 Rice is also a good choice, along with your favorite legume dish. Prepare the vegetables by heating the oil in a large saucepan over medium heat. When hot, add the broccoli, cauliflower and carrots, and sauté until just tender. Stir in the mushrooms and cook for another few minutes. Transfer to a lightly oiled large casserole dish. To make the sauce, combine the cashews with 1 cup of the almond milk, lemon juice, nutritional yeast and salt in a blender. Blend until smooth, adding a little more almond milk as necessary. In a medium saucepan, melt the coconut oil over medium heat. Stir in the flour and gradually add the remaining almond milk and whisk until thickened. Stir in the cashew paste and stir to thicken for another few minutes. 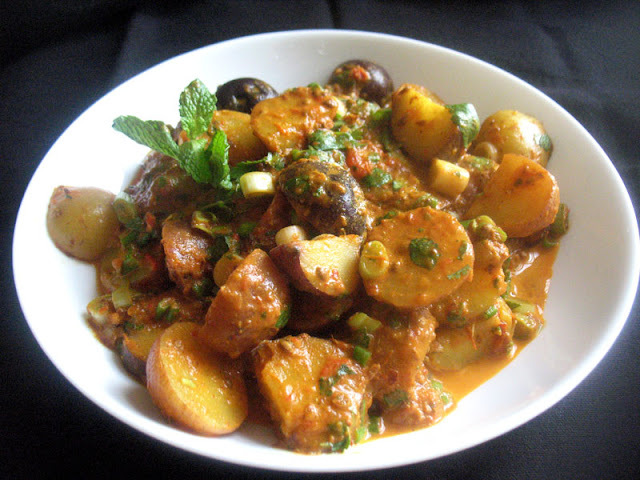 Remove from heat and stir into the vegetables in the casserole dish. To make the topping, combine the melted coconut oil or sesame oil, cornmeal, pine nuts or sliced almonds and nutritional yeast in a medium bowl. Spread evenly over top the vegetables. Bake in a preheated 350° oven for 15 to 20 minutes until the topping is golden and the casserole has thickened. Let sit for 10 minutes and serve hot. This dish sounds amazing, I am drooling to eat it.Book marked it to try soon. Lisa, I have mentioned you and your blog in my second anniversary post, please come and read. I hope you will like it.